Danish firm Schmidt Hammer Lassen has released visuals of its first US project: a mixed-use development in Detroit, Michigan, bound by two glazed towers overlooking the city's historic theatre district. Schmidt Hammer Lassen was commissioned for the Monroe Blocks scheme by developer Bedrock Detroit, and is working on the design with local architects Neumann Smith and engineering firm Buro Happold. Two glazed towers will stand at either end of the 1.25-hectare development boarding Monroe Avenue, the city's historic theatre district. Its oldest remaining theatre, the National Theatre by renowned Detroit architect Albert Kahn, stands on the site. It was built in 1911 and is listed on the National Register of Historic Places. The future of the theatre and its role in the development are yet to be decided. The 35-storey office tower and 26-floor residential block will be accompanied by three mid-rise buildings of between six and 15 storeys containing further apartments. Pedestrian routes will permeate the development, providing access to Farmer Street to the east and west, Randolph Street to the north, and Cadillac Square Park and Campus Martius to the south. These links tie together roads forming part of the radial urban plan devised by the area's chief justice Augustus Brevoort Woodward, following a fire that wiped out the city in 1805. The office floors are raised above street level by a tall glazed lobby adjoining Cadillac Square, while the housing tower tapers towards Randolph Street in further efforts to make make the public spaces within inviting. "Our Scandinavian heritage has a strong influence on the way we approach city building on this scale," said Schmidt Hammer Lassen senior partner Kristian Ahlmark. "We always try to think urbanism, city space and the built environment in that order. In Detroit, we found many existing spaces that held a great amount of urban qualities, but laid undefined due to the vast amount of open space," he continued. "Our project is very much about stitching together and re-establishing some of the indisputable qualities of the original masterplan." "What we're doing from a public space standpoint within the development is going to be special," added Bedrock's president Dan Mullen. "It's not just a big, tall building. It's a big, tall building that interacts with street level and public spaces throughout. There's going to be different pods and nods of great spaces to hang out and for people to get together." 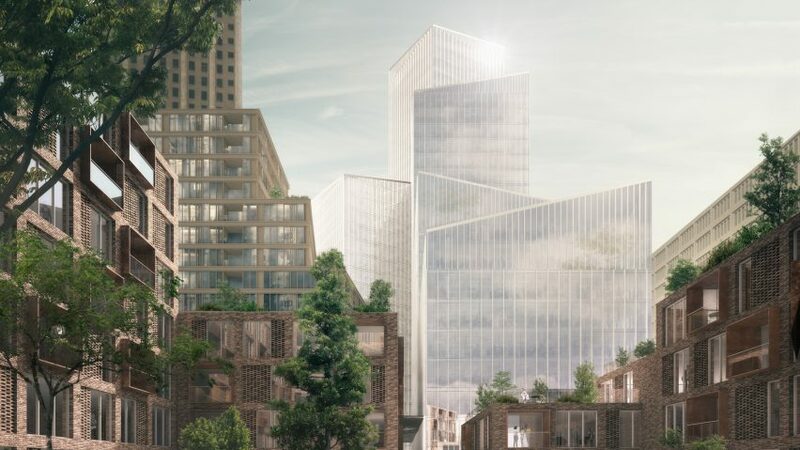 Around 480 apartments will be split between the tower and the collection of mid-rise blocks, which will feature stepped outlines affording a series of terraces, angled to overlook the pedestrianised zones in the centre of the development. The mixed-use development will also include shops, and sport and leisure facilities. At least 75,000 square metres of the scheme will be set aside for offices, with 15,000 square metres for shops and 4,400 square metres for public space. Work on Monroe Blocks is expected to begin in 2018 and complete in early 2022. Monroe Blocks is one of several key redevelopment projects underway in the city. Earlier this year SHoP Architects revealed its plans for the replacement for the historic Hudson's department store, which will rise to 224 metres to become the city's tallest building.